The kalmstrom.com Solutions are licensed with subscriptions, not with one-time payments. A subscription gives you the right to use one or several of our products with full support and free upgrades. The subscription fees are paid yearly or monthly. Click on the icon for kalmstrom.com Solution you want to subscribe to. A subscription gives a better security and a higher long term value than a one time payment. When you subscribe to a kalmstrom.com Solution, you never have to use old or bad software. Instead you can always have applications that work well and are compatible with both the latest Microsoft technologies and older platforms. As a kalmstrom.com Subscriber you will get the extra care we are so happy to give! "The kalmstrom.com Subscription system allows the kalmstrom.com team to focus on delighting existing customers, instead of hunting new ones all the time. We want long time relationships, not quick cash, and therefore we always give free support and upgrades to subscribers." 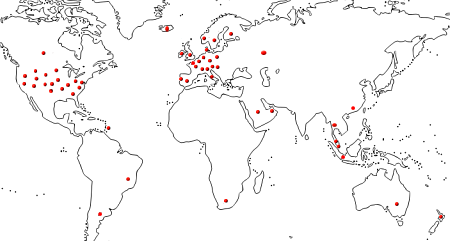 You can find kalmstrom.com Subscribers all over the world. This map shows countries and states with at least one subscribing organization ‒ mostly several. Big, international companies and state-owned organizations use kalmstrom.com Solutions, but also many small and one-person businesses. Thank you for caring about what you do and the products you sell. It is a very welcome and refreshing change from the normal terrible customer service we get here in the US. I love your software and your company. Please continue to make great products and have great customer service. Your efforts are very much appreciated! THANK YOU!